With mortgage rates nearing record lows in the first quarter of 2016, now is a better time than ever to finance a home in the Seattle area. Whether you’re looking to purchase more home or trying to keep your interest costs down, the latest reports say that the low interest rates support your goals. What is different about home purchases around Seattle? Due to the influx of technology jobs in the Seattle area, home builders have had a difficult challenge supplying enough homes to meet the demand. Over time, homes have been progressively harder to come by. In response, a lot of Seattle newcomers simply choose to rent instead. Unfortunately, with demand being so high for renting, landlords have raised rent prices at a premium, making home buying a better use of the money. Rent prices in Seattle are at an all-time high. Washington state mortgage rates, however, are on the opposite trend. Simply put: if rents are going to be a little higher in Seattle and you want to own a home, it’s financially more sound to put the money into home equity. One of the benefits of having a mortgage over having a lease is that a fixed-rate mortgage can stay low even when both rates and rents increase in the future. With this in mind, purchasing a property is a great way to secure your monthly expense, as a lease can change in price from contract to contract (usually annual) but a fixed-rate loan will not change during its entire term. Then, should you choose to lease your own property out as an investment property, you have the added benefit of your secured low mortgage expense as Seattle home prices and rents rise. You stand to profit both from the equity and the monthly income without doing anything more than seizing current low mortgage rates while the home is still your primary residence. Rates have dropped nationwide for over 6 consecutive weeks, and Seattle is no exception. You can actually track current rate trends right now. The main reason home purchases in Seattle and the surrounding areas are not higher is due to a lack of homes listed for sale. The scarcity of inventory is actually making it harder for many first time homebuyers to find a home. There is plenty of demand and people wanting to buy instead of rent. With fewer homes for sale in Seattle, once you do find a home on the market that meets your needs, preparation will be key to closing the deal. First time homebuyers will need more education and advantages to have an offer accepted to purchase a home in such a competitive environment. To get ahead of other prospective buyers on a purchase, check out our ebook Getting Approved: What Every First Time Homebuyer Should Know In 2016. Or, if you’re just looking to speak to an experienced loan officer, contact us. The same rates that control new mortgages also determine mortgage refinances. If you’re already a homeowner, unlike a first-time buyer, you don’t have to find a property in the Seattle market in order to take advantage of low rates. 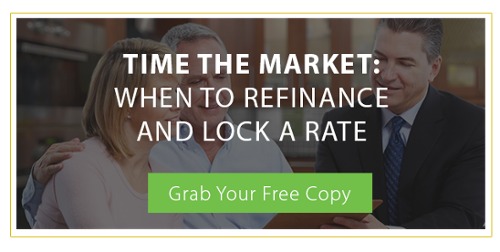 If you want to take advantage of a refinance, learn more in our ebook Time The Market: When To Refinance And Lock A Rate. You can turn around and immediately use the knowledge on a refinance application, just like that. While there are specific factors that buyers may be searching for in a new home, there are also a few warning signs that home buyers should keep their eyes open for. The following are among the top red flags that may serve as warning signs. next post: Why Do I Need A Home Appraisal If I Have Lots Of Equity?